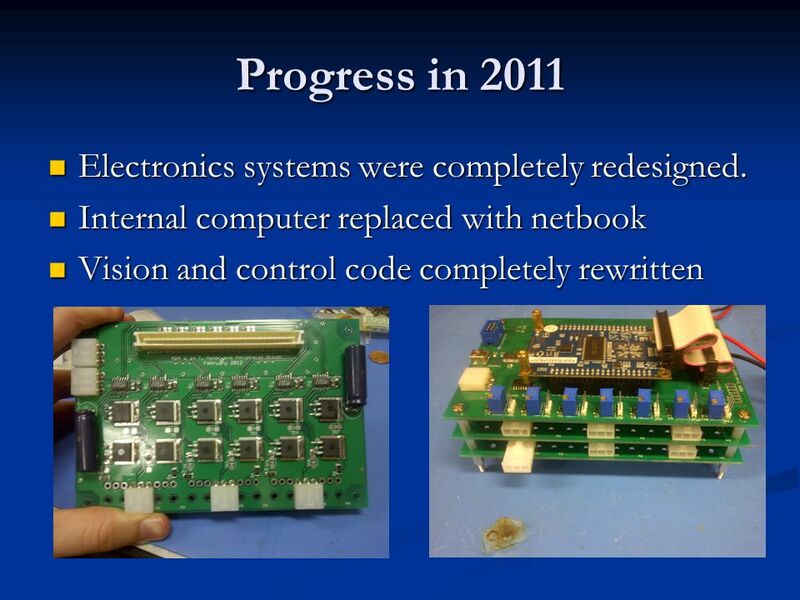 Mechatronics Design Association EngSoc Budget Presentation 2012. 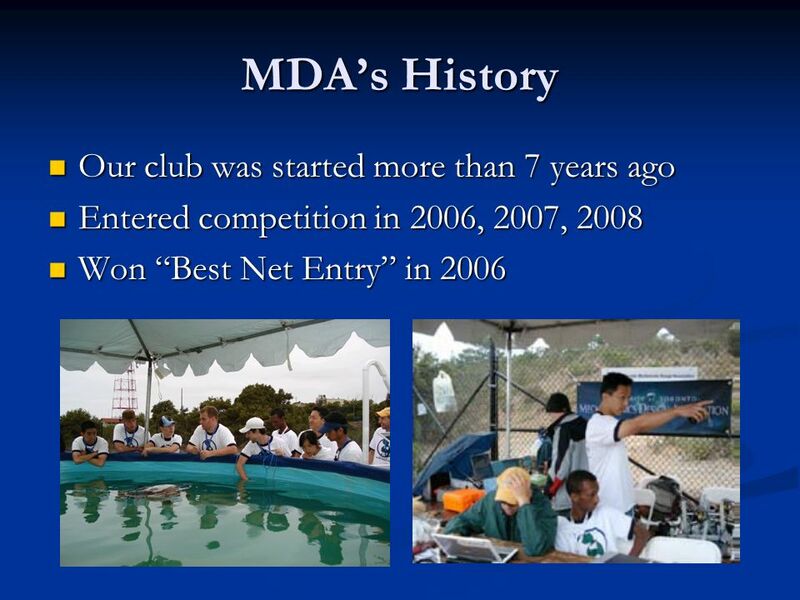 5 MDAs History The sub flooded in the 2009 competition, burning out the onboard computer The sub flooded in the 2009 competition, burning out the onboard computer Most of the original club members left in 2010, a year where nothing really happened. Most of the original club members left in 2010, a year where nothing really happened. The current executives revived the club and began a redesign of the vehicle in the summer of last year (2011). 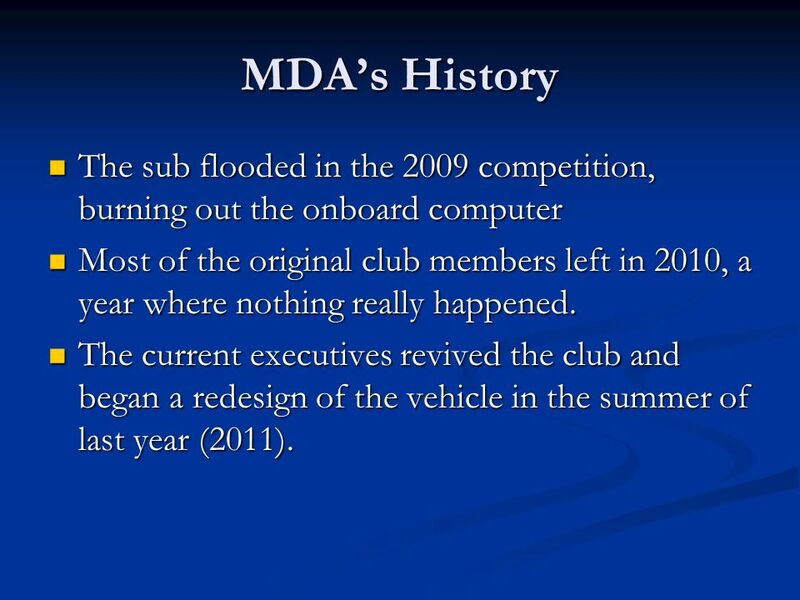 The current executives revived the club and began a redesign of the vehicle in the summer of last year (2011). 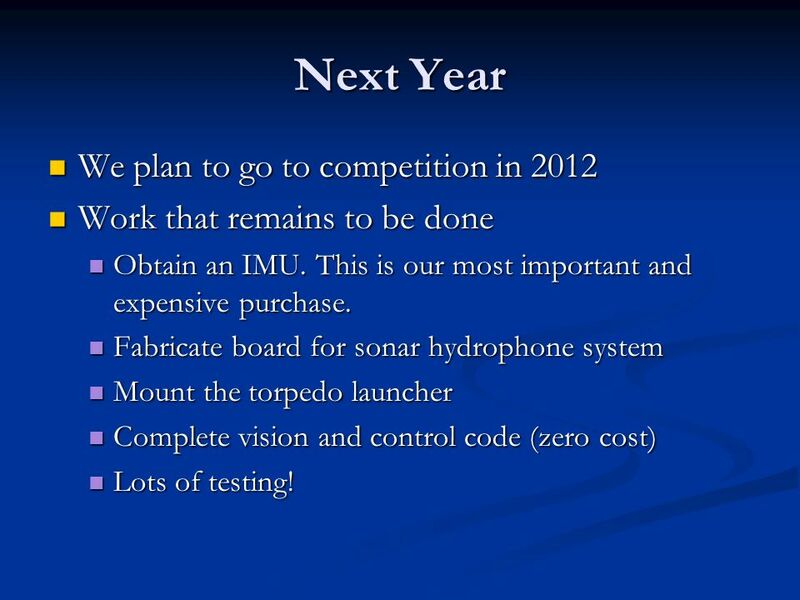 8 Next Year We plan to go to competition in 2012 We plan to go to competition in 2012 Work that remains to be done Work that remains to be done Obtain an IMU. This is our most important and expensive purchase. Obtain an IMU. This is our most important and expensive purchase. 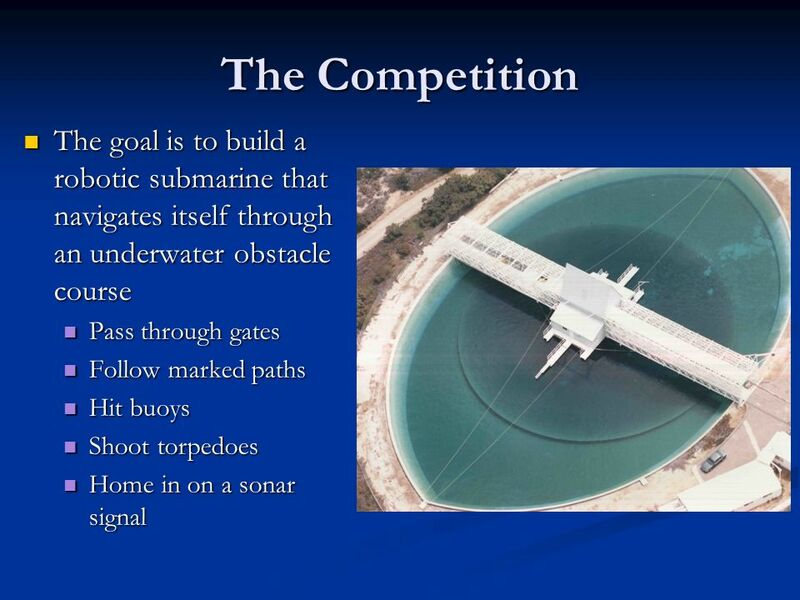 Fabricate board for sonar hydrophone system Fabricate board for sonar hydrophone system Mount the torpedo launcher Mount the torpedo launcher Complete vision and control code (zero cost) Complete vision and control code (zero cost) Lots of testing! Lots of testing! 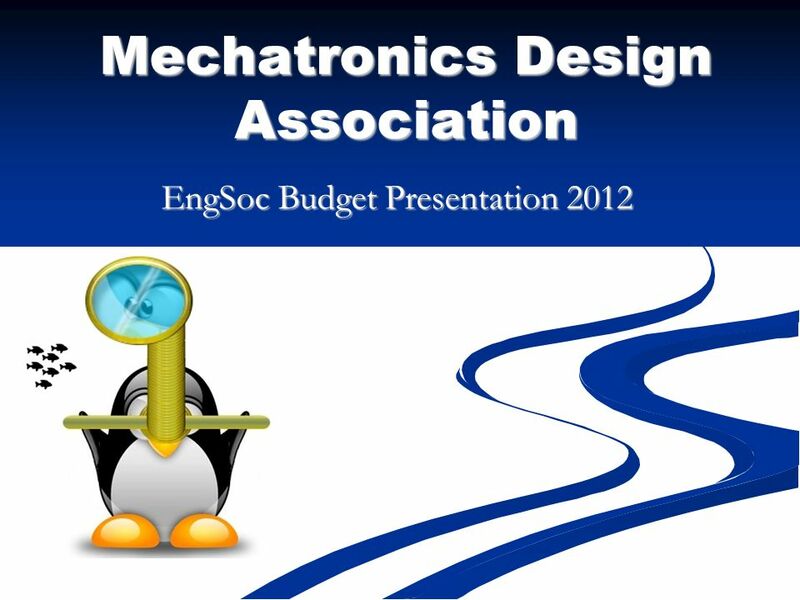 Download ppt "Mechatronics Design Association EngSoc Budget Presentation 2012." MDA Info Session General Meeting: Information & Recruitment Sept 19, 2011: 6-8p BA3008 Mechatronics Design Association General Info Session Sept 2011. Fairfax County Board of Supervisors Transportation Sub-Committee Briefing Federal Highway Administration Eastern Federal Lands Highway Division Robert. All You Ever Wanted to Know about Graduation, Completion, and Dropout Rates System Support Team Region XIII © 2011 Region XIII. First Unitarian Universalist Church of San Diego Campus Renovation Project Construction Budget Options January, 2011. ENTSOG’s view on next steps for regional co-operation Nigel Sisman Senior Adviser Stakeholder Group, GRI NW, Brussels, 26 Nov 2010. MT. PLEASANT A CLOSER LOOK AT ACADEMIC PERFORMANCE. Rotarians at Work District Assembly Agenda History & Status History & Status Rotarians At Work Website Rotarians At Work Website Project Discussion. 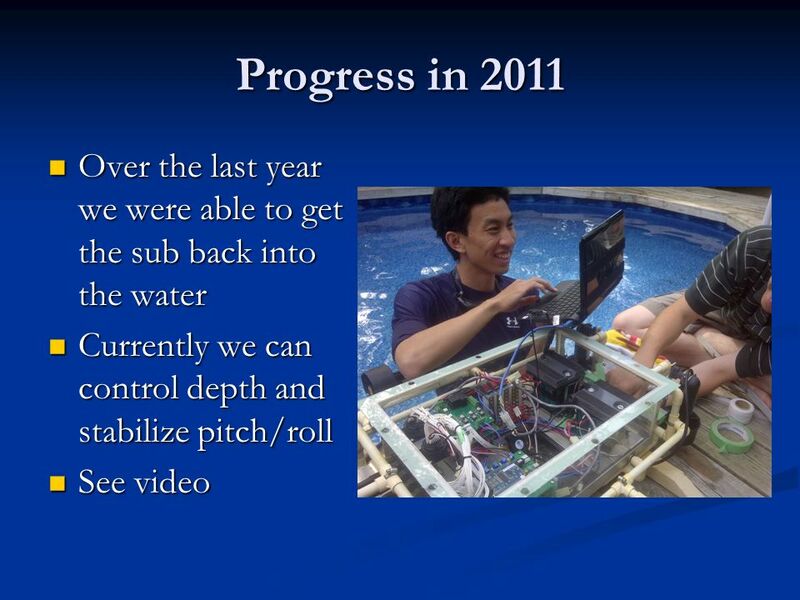 PALO ALTO UNIFIED SCHOOL DISTRICT PROGRESS REPORT MAY 25, 2010 K-12 Mandarin Program. TechStat Presented By, Agency Seal. TechStat Thesis 2 Point 2 Point 1 Point 3. MIDN 1/C Hansen, MIDN 1/C Fincher, MIDN 1/C Keith, MIDN 1/C Noyola, MIDN 1/C Topp Advisor: CAPT Nicholson, USN. Waterloo Aerial Robotics Group WARG Mandate: The Waterloo Aerial Robotics Group is a team of University of Waterloo students who, with the support of our. MicroCART Micro processor C ontrolled A erial R obotics T eam Abstract MicroCART is a group of EE/CprE students tasked with developing an autonomous helicopter. 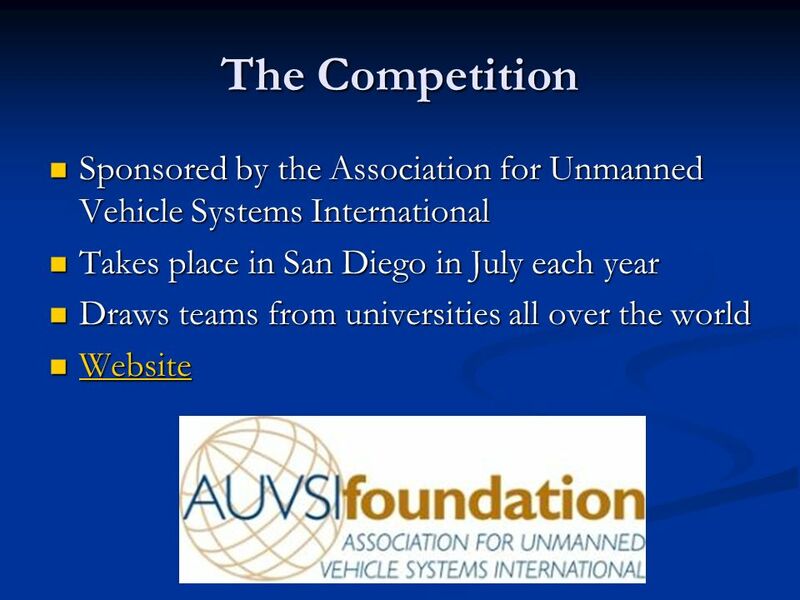 ORGANIZED BY: Student Autonomous Underwater Challenge - Europe (SAUC-E) 2006.